We waited through the pacers of Berlin and the wind of Chicago to finally arrive at the end of the fall marathon season. The New York City Marathon is Sunday, with the women starting at 9:10 a.m. and the men following a half-hour later at 9: 40 a.m. local time. If you aren’t running, then you are certainly waking up early to watch. In addition to the paces and places that you will be monitoring, here are a few over/unders to keep track of on Sunday morning. You just as easily could substitute Wilson Kipsang’s name for Mutai. Kipsang is younger than Mutai, has a faster personal best and has won two majors in a row. If the race were anywhere but New York City, Kipsang would be the pick. But in New York, Mutai’s age and experience become an asset and expose Kipsang’s only legitimate weakness, winning a tactical race. Mutai has mastered this course and in the two years he has won the race, obliterated very deep fields both times. As such, I have Mutai as a slight favorite. I’m hoping his command for this race and Kipsang’s consistent brilliance are able to work in concert with one another and we see a close race all the way through Central Park. With a highly anticipated duel there is always the disclaimer that it could turn into a route. Maybe Kipsang is incompatible with the type of running needed to win New York? Or, what if Mutai’s best days are behind him? He did only finish sixth in London this April. I don’t believe either of those two statements, but those are the only possible explanations for why we may not have an extremely close race on Sunday. Surely Kipsang won’t make a big mid-race move like he did at the 2012 Olympics. That push likely cost him the gold medal. I’m assuming he shadows Mutai for as long as humanely possible, only advancing off Mutai’s shoulder to grab water, or when he is completely certain that he can sustain a faster pace to the finish line. I lean Mutai, solely because of his success on the course. This race in many ways is the resolution of what we could have seen in the fall of 2012. 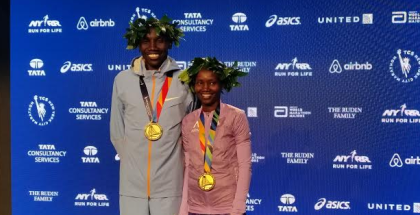 The two should have raced in New York, but Mutai opted for the Berlin Marathon and Kipsang was scheduled to run in New York until the race was cancelled. In a nice bit of symmetry, we get to wind the clock back and to see the two race in New York. Two years have past, and yet both men are in virtually the same position as they were in 2012. Mutai enters as the defending champion (just like he would have if he raced in 2012) and Kipsang, once again, is coming off a 2:03 performance the fall prior. 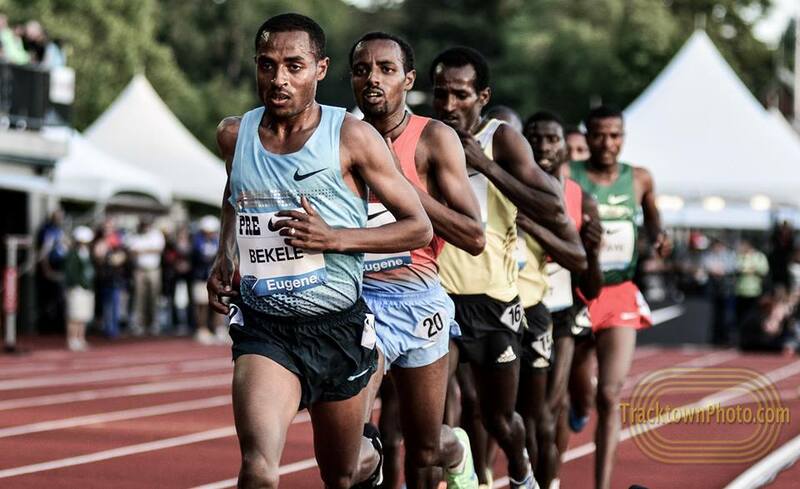 There are 11 men with faster personal bests than Meb Keflezighi. I’d have to be extremely dense to think that fact has any bearing on Meb’s ability to place in the top five, but it does show you how deep the race is, from Mutai and Kipsang on down. I think he finishes somewhere in the 5-11 spot, which would be a very strong result for him. That’s a very wide range, but we don’t know much about Meb’s preparation for this race and he has finished all over the map in New York City. With a strong run, the other American men (Nick Arciniaga, Ryan Vail), could see the top ten. It looks a bit tougher in the women’s race because it’s still unclear who the best American woman is in New York. That will make for an interesting race-within-the-race. Desiree Linden has the most recent success, but has never run this race. Deena Kastor and Kara Goucher are the other name brand Americans in the race. I think Linden will emerge, but will finish lower than the top American man. As a group, the American women are actually pretty strong. Scanning the start lists, there is a bit of talent gap between Edna Kiplagat/Mary Keitany/Buzunesh Deba and whoever is the favorite for fourth place. On a really great day, an American could create some mischief in that second tier. But that might be asking too much on Linden’s first crack at the course. That is Goucher’s stated goal. 2:28:00 is more than two minutes slower than her fastest time on the course. With a conservative goal like that, you’d like to take the under. But this is the marathon where modest goals can turn into pipe dreams by mile 20. Since hasn’t run a marathon since Boston in 2013, I think anything under 2:30 is a win. She’s at the tail end of her career, but she still remains relevant in American women’s marathoning. Goucher is on a different level from Shalane Flanagan, yet very much in the discussion for the 2016 Olympic team. While the men’s leaders might be in lock step entering the park, there is a strong possibility that the women’s race will take on an entirely different format. Keitany recently had a child and has been away from major marathons for a few years, but let’s remember that her approach to racing seems to be like Pre’s in Without Limits before Bowerman corralled him for that race against George Young. Maybe Keitany is wiser after her hiatus. She is certainly just as fast. In September, she ran the second quickest half-marathon of all-time in a tune-up race. She has entered the Central Park with a big lead before only to see it evaporate on the final hills. Does she try a different approach? Hopefully not. A stride-for-stride battle is fun, but I don’t think anything beats the anticipation of someone clinging to a lead as the chase pack hunts them down in the waning miles. Whatever it is, it will be the exact amount for the women to be finishing right as the men’s pack is breaking apart. Which brings me to the next over/under…. I think three is the max number. Any more than that and by definition the move can’t be very crucial. ESPN2 did a fine job last year televising the race and I’m sure we will see something similar on Sunday. No matter how good the coverage we will miss the move, because we always miss the move. But in ourselves, that we watch marathons on television. He doesn’t do this rabbit-free thing very often. Kipsang might be surprised at halfway when everyone in the pack keeps running. Of the four major marathons this fall (two races, two genders), only the men’s record in Berlin fell and they took the world record with it. When Mutai ran 2:05:06 in 2011, nobody was within a minute of him. There is room for improvement with more competition, provided the weather is good. Like many of the top women’s marathon marks, the course record in New York comes from the early 2000s. Keitany and Kiplagat are capable of running that fast. Last year, Buzunesh Deba had Tigist Tufa to run with when she dropped the group, but to get a sustained fast pace I think you need more than just two working together–at least for the first 15 miles. Come on, it should be zero. I don’t watch Meb the same way I watch other pro marathoners. I throw rational thought and human physiology out the window. If he gets dropped, then he must just be biding his time. If the pace starts quickly, I’ll create a scenario where the leaders fall apart, setting the race up perfectly for him. If he is running faster than his personal best, then he will maintain the pace and not crumple like everyone else does who overextends themselves in the first half of the race. All of this runs contrary to what we known about the marathon. It’s mythology built up over years of watching him exceed expectations. Sometimes the irrational actually happens, like in Boston this spring, which is why Meb is must-watch wherever he is on the course. Even last year in New York, when he ran 2:24 and finished 23rd he still managed to be one of the biggest stories of the race.